Billionaire Investor’s Dire Warning: Sell Everything! Jeffrey Gundlach, also known as the “Bond King,” is one of the most accomplished fund managers on the planet. Just six years after launching his own firm, DoubleLine Capital, he’s at the top of the bond world, with more than $100 billion under management. When Gundlach speaks, the press genuflects. In a recent Reuters interview, Gundlach told investors to head for the hills. Sell everything! Nothing here looks good… The stock markets should be down massively but investors seem to have been hypnotized that nothing can go wrong. 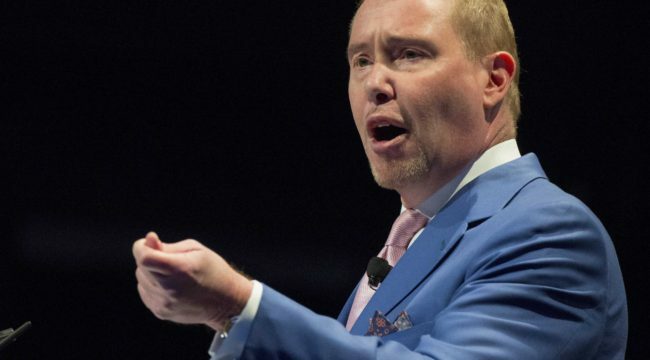 Why is Gundlach headed to the bomb shelters? Economic growth is in the toilet… corporate earnings are accounting games… corporate debt is soaring… and the Fed is out of control in an effort to make everyone a winner. This artificially inflated stock prices. And, of course, it made investors and executives happy with ever-increasing dividends and executive bonuses. That’s what is propping up our all-time high stock market, not real growth. So with doom and gloom permeating, is there one investment these investing icons actually like? “I am not selling [my] gold,” Gundlach told Reuters. He holds gold, and gold miner stocks. Gross agrees. He points to safe havens like gold and land as the sane options in an insane world. So are Gundlach and Gross right? Is a massive correction that will send us all back to the Stone Age imminent? They can’t know. They’re skilled investors, not crystal ball readers. Sure, a 50% S&P meltdown will happen. A crash is inevitable. But trying to predict when that will happen is a fool’s errand. With the “prediction” approach, you’ll get lucky and take big gains occasionally. Other times you’ll be nailed in the kisser with crushing losses. This ridiculous seesaw is a surefire way to cat-food dining. You see, many investors follow Gundlach and Gross via news headlines… and then invest accordingly. But if you rely on “a day late and a dollar short” media reporting to track heavy hitters, you’re late to the party every time. Precious metals have been on a massive tear to the upside this year, long before any of the “Bond King” warnings. The market seems to always know the right way. And that has created a rising price trend in gold that my proprietary system picked up back in March. My trend following system got two more precious metals buy signals in April. And my Trend Following subscribers are up 50%, 32% and 70% on these three recommendations to date. If you weren’t following gold’s price trend, you missed out big time. Could gold continue higher from here? Of course. It can also head lower. But waiting for the next media story on which direction Gundlach and Gross think it’s headed is certifiably crazy. That’s no system. The only reliable indicator for gold’s direction is its price trend. That’s how you can make the big money, by following the trend. And like all profitable market trends, they form long before any of the media hyperventilation. Please send me your comments to coveluncensored@agorafinancial.com. I want to know what you’re thinking.